Mildred Bryant Brooks was born in Maryville, Missouri July 21, 1901, but grew up in Long Beach, California. Always desiring to be an etcher, she was finally able, in her late twenties, in 1929, with marriage and motherhood, to study that medium with artist Arthur Millier, also an art critic for the Los Angeles Times. 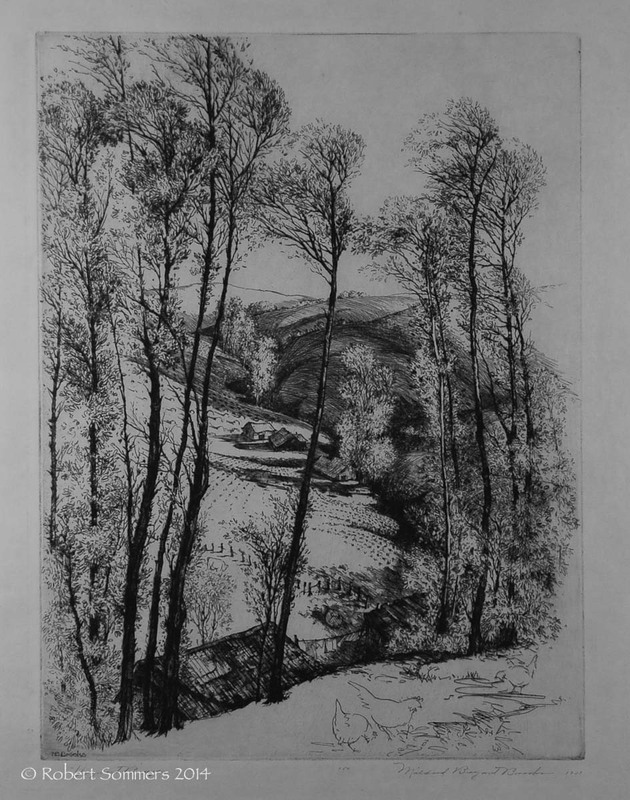 She enjoyed a successful thirty-plus year career as an etcher, but tragically, her eyesight failed in the early 1960s, not allowing her to work in etching during the more than thirty years that remained before her death in 1995. Brooks studied from 1921-1925 at the University of Southern California, in Los Angeles, with Frank Tolles Chamberlain. With her marriage to Don Brooks in 1924, she became a part-time student, as well as a part-time teacher there. She also attended the Otis Art Institute and Chouinard Art Institute in Los Angeles. She was an artist-in-residence in 1946 at Pomona College, California. She taught, in 1952 and 1954, at the Los Angeles County Art Institute. Living in South Pasadena, California, and attempting to cope with her bad eyesight, Brooks tried the larger images involved in mural painting, as well as moving in another direction, interior decoration. Ill health eventually forced her into a Santa Barbara, California rest home, where she died on July 3, 1995. Brooks was the President of the California Printmakers eight times, exhibiting frequently with the group. She had one-person exhibitions at the Smithsonian Institution, Washington, D.C. in 1936; and the Laguna Art Museum, in California, in 1975. Brooks also exhibited nationally and internationally at the National Academy of Design, New York City; Society of American Etchers, New York City; Pennsylvania Academy of the Fine Arts, Philadelphia; Library of Congress, Washington, D.C.; International Printmakers; and the Paris International, in France. Her works are in the collections of the Los Angeles County Museum of Art; Laguna Art Museum; Fine Arts Gallery, San Diego, California; Smithsonian Institution, Washington, D.C.; National Gallery, Washington, D.C.; Cleveland Museum of Art, Ohio; University of Nebraska, Lincoln; and University of Vermont, Burlington. In addition to twenty-two national and international awards given Mildred Bryant Brooks, she received the Pasadena Arts Council Gold Crown Artist Award in 1976.